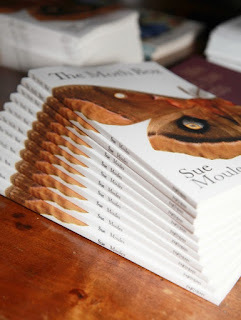 I'm delighted to present to you another author who will be joining us at the Book Fair in Llandeilo for the very first time: Sue Moules. 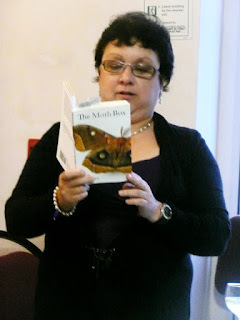 I am bringing my poetry collections to the book fair: In the Green Seascape, (Lapwing), The Earth Singing, (Lapwing) Mirror Image (Headland) and The Moth Box (Parthian). My poems are accessible and inspired by the landscape and my life in West Wales. I have lived in Wales for over forty years and feel rooted here, although I’m always conscious that I am an incomer. I feel that being an outsider is the role of the poet, being on the edge of things. “Sue Moules underscores the portraits, memories and close observations of her changing world with a sense of life’s brevity, its “wave against the shortening beach”. A genuine humanity illuminates ‘In the Green Seascape’”. Paul Henry. I like buying books and have to confess that I don’t read them all. I love the smell of paper and print and enjoy going into bookshops with that powerful newness of words. I also enjoy second hand bookshops; having worked in one I know they have personalities and a charm. The books there have been read and loved. Their pages aren’t pristine, but they have that brown smell of memory. My favourite book is always the last one I’ve bought, or the one I’m reading now.